One of the most chilling incidents was the central shaft accident. 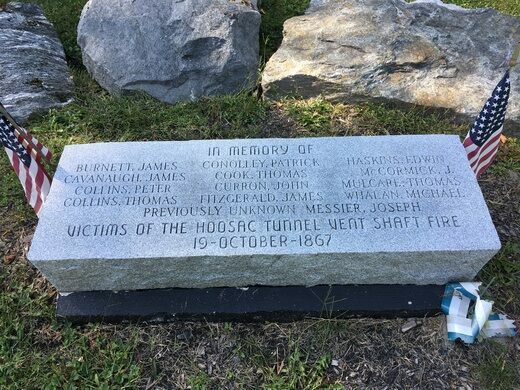 The tunnel has a 1,000-foot vertical chimney for exhaust to escape, and on October 17, 1867, fumes ignited, causing an explosion that destroyed a hoist used to lower men, equipment, and supplies. The accident rained equipment, supplies, and flaming hoist parts down onto 13 men who were working at the bottom of the 583-foot-deep unfinished chimney. The pumps were also destroyed, flooding the shaft. The miners on the surface of the mountain, after various rescue attempts, believed nobody survived the accident. Months later, when they made it back to finish excavating the shaft, they grimly discovered that some had actually lived for a time, making a makeshift raft to deal with flooding. Despite the death toll and other various setbacks, the tunnel was eventually completed and was used by both passenger and freight trains. Today, a few freight trains still use it. 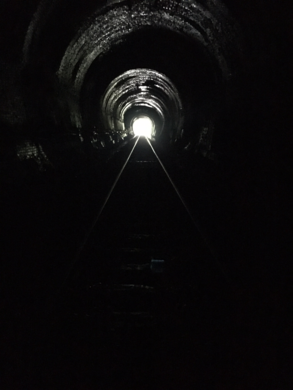 Of the two portals of the Hoosac Tunnel, the east is easiest to see. At the intersection of Whitcomb Hill Road and River Road in Florida, take River Road northwest about half a mile until it crosses over a set of tracks. The tunnel entrance can be seen to the left. 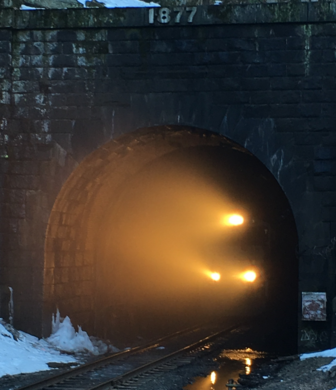 The tunnel’s west portal is located in North Adams. Off Church Street, which parallels the railroad tracks, close to where it intersects West Shaft Road, is a path through the woods. The west entrance is a third of a mile down it. 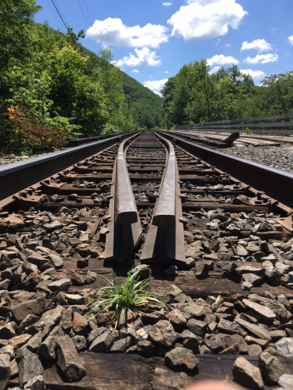 There’s also a free museum that was a former railroad yard dedicated to the Hoosac Tunnel and the railroad industry at 115 State Street in North Adams. Adapted with Permission from: The New England Grimpendium by J.W. Ocker. The East tunnel entrance (East Portal) at the intersection of Whitcomb Hill Road and River Road in Florida, take River Road northwest about half a mile until it crosses over a set of tracks. The East Portal can be seen to the left. 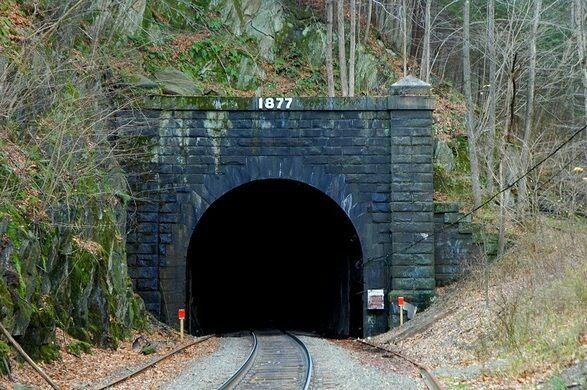 The tunnel's West Portal is located in North Adams. Off Church Street, which parallels the railroad tracks, close to where it intersects West Shaft Road, is a path through the woods. The West entrance is a third of a mile down it. The Central Shaft and the ventilation fans are located about 1.3 miles from Rt-2, turn South onto Shaft Road, follow to Central Shaft Road in Florida, the fans are on the East side. Across the street from the central shaft building in a small grassy area is a memorial to the victims of the devastating shaft fire which occurred during tunnel construction. Note: This is an active railroad with trains traveling at reduced speed in the tunnel, these trains maybe hard to hear as they round the curves, so be safe and stay off the tracks.